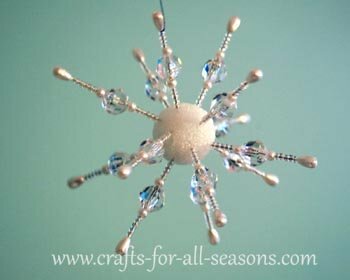 This beaded snowflake craft is made from beaded corsage pins, simply pushed into a foam ball. These come out so beautiful, and sparkle and catch light when hung by a window. They look so pretty in groupings. 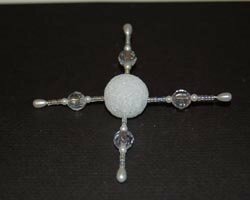 Each snowflake can be made to look unique, depending on what beads are used and how they are threaded. Try making several and placing them on a clear glass plate with some votive candles, for a unique winter centerpiece. Try placing them along the fireplace mantel. These also look beautiful using shades of blue beads. These will capture the look of winter, and bring a look of the outdoor season into your home. 1. 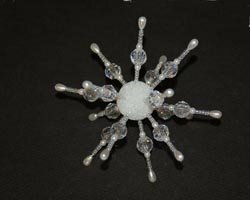 Begin the beaded snowflake craft by threading the beads on one of the corsage pins. 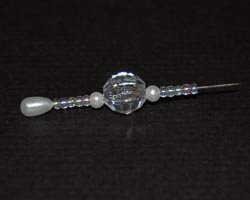 Choose any pattern you like, or follow what I did as a guide: thread on five clear seed beads, one round 4 mM pearl bead, one round 10 mM crystal craft bead, one round 4 mM pearl bead, and 5 clear seed beads. 2. Next, push the end of the pin into the foam ball, being careful to go into the ball perpendicular (at a right angle), as shown. 3. Continue to thread pins and push them into the foam ball. Following a symmetric pattern looks best, but is not mandatory. 4. 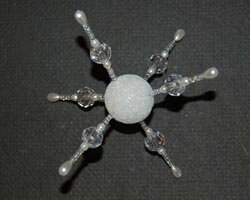 When you are finished and happy with the look of the snowflake, it is best to reinforce the base of each pin with a drop of glue, right where it enters the foam ball. 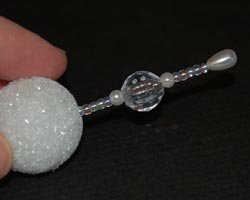 Otherwise the pins could be pulled out easily from the weight of the snowflake when hanging, and the beads will drop everywhere (can you tell this happened to me several times?). Add a black thread or clear fishing line for hanging, if desired.